It goes without saying, that a durable and more importantly leakproof water bottle is an absolute must when venturing into the backcountry and over the years I have tried many of them. For a long time my favourite was the virtually indestructible SIGG aluminum bottle but ultimately found it a pain to clean, though liked how all the dints and scores gave it a characteristic appearance. These days I stick with a bog standard BPA free Nalgene Silo 1.5 litre bottle. Whilst for day trips this usually suffices, I usually end up carrying a smaller water bottle along during the warmer months. For overnight hikes it’s a different matter and as many would attest – water holes are often scant when you need them and hence the need to carry extra water. This is where a Nalgene wide mouth cantene comes into its own. The obvious advantage of carrying one is its easy storage and collapsibility meaning it doesn’t compete for extra space in your pack. For the most part, you can forget about it until time comes to fill up. The cantene I purchased was the 48-ounce (1.5 litre) version and was pleased to find that in real terms it actually holds around ten percent beyond its advertised capacity. 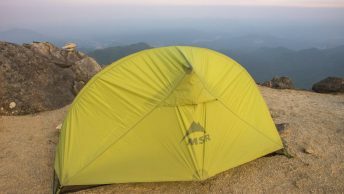 At only 65 grams its ideal even for ultralight hikers. The wide mouth means it can be packed with ice cube and as the manufacturer states on their website it accommodates all major filters and purifiers. Other advantages include a convenient bottom gusset for upright standing and a “fill line” indicator. Recommendations include to clean with warm water, mild soap or baking soda and to leave cap off during storage. A lightweight, durable and collapsible bottle with a sturdy base which takes up minimal space in your pack. Nalgene wide mouth cantene 48 oz.